When a band's instrumentation contains such entities as Hammond organ, flute, and Yembe, you kind of have an idea that the outfit is a bit progressive. 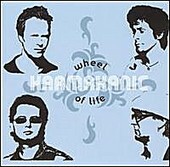 Such is the case with Karmakanic, a quartet whose opening track runs nearly 15 minutes long and whose eight-track endeavor runs over one hour. Needless to say, these guys like to jam, and if you have a penchant for lush melodies extended to the max with overly proficient musicians going off like there's no tomorrow, then check out the somewhat masturbatory but overall sensory overloaded Wheel of Life.